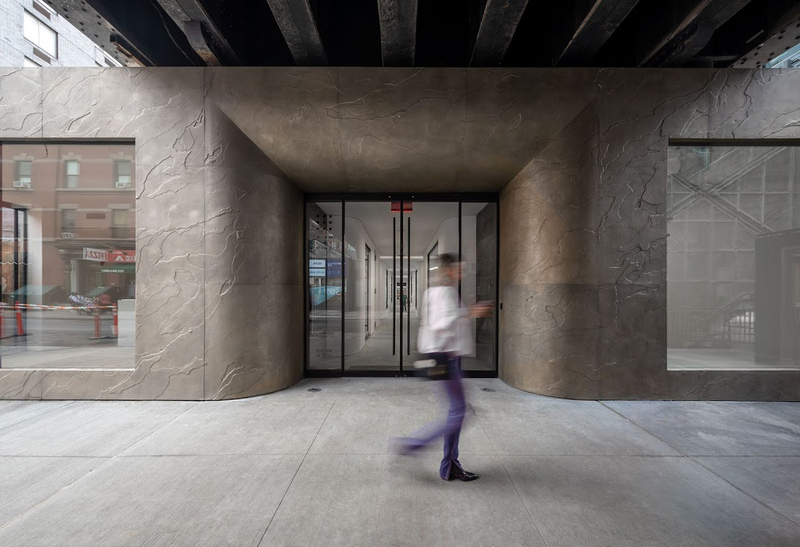 The new flagship location for the Kasmin Gallery opened next to the High Line last October, sporting a boxy, angled exterior of white concrete with a subtle wood texture. Designed by studioMDA, the 3,000-square-foot building features a column-free interior that can smoothly showcase large-scale sculptures beneath a coffered ceiling full of skylights. The super-waffle grid not only diffuses natural light into the space below, but also creates a pattern for the gallery’s rooftop sculpture garden. The undulating landscape, designed by Future Green Studio, allows plants and artwork to be set deeply in the soil. 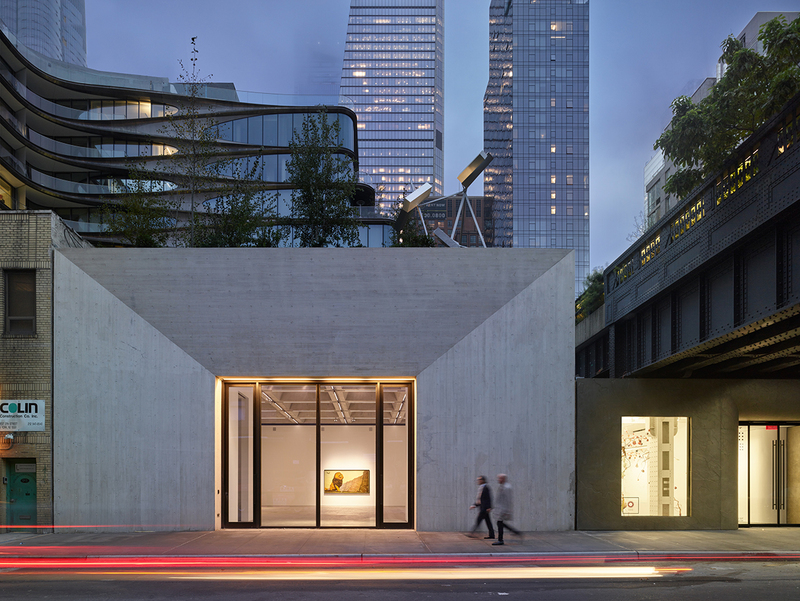 The outdoor gallery is visible from the elevated park next door, and is part of Related Companies’ latest efforts to broaden the artistic and architectural appeal of Zaha Hadid’s adjacent 520 West 28th Street condominiums. Kasmin Gallery’s rooftop garden attracts High Line visitors and condominium residents alike. Notably, the High Line Nine, an elongated, multitenant gallery directly underneath the rail park, was also designed by studioMDA. 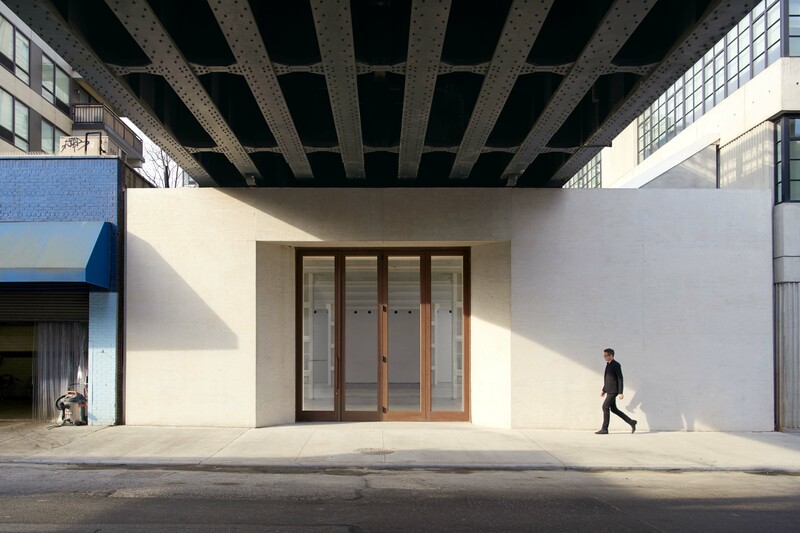 The much anticipated Lisson Gallery is set to open in New York next month on 504 West 24th Street underneath the High Line. The new exhibition space will be the gallery's fourth and first outside of Europe, with currently two in London and one in Milan. Designed by New York practices studioMDA and Studio Christian Wassmann, both whom have an established pedigree in gallery design, the space is formed around the foundations of the pre-High Line. In keeping with the minimalist aesthetic of the gallery's London counterparts, polished concrete is used throughout the building. An exposed all-white concrete facade will look out onto West 24th Street. A more private area for office and art handling will be housed on the building's south side. The new gallery will cover 8,500 square feet, comprising 4,500 square feet as gallery space, meanwhile 4,000 square feet will be used for the aforementioned offices, viewing spaces and storage. For the inaugural exhibition, the gallery will showcase the recent paintings of Cuban-born artist Carmen Herrera. This will last from May 3 - 18 June, 2016 and be followed by the first solo exhibition in the United States by filmmaker and artist John Akomfrah (1 July –12 August); a new installation by Ryan Gander (16 September –15 October); and an exhibition of new work by Ai Weiwei (5 November –16 December 2016). Under the supervision of Nicholas Logsdail, Lisson Gallery and curatorial support of Greg Hilty in London, the Lisson Gallery New York will seek to develop the international profile of its hosted artists, exhibiting those who have not shown in New York recently or at all.